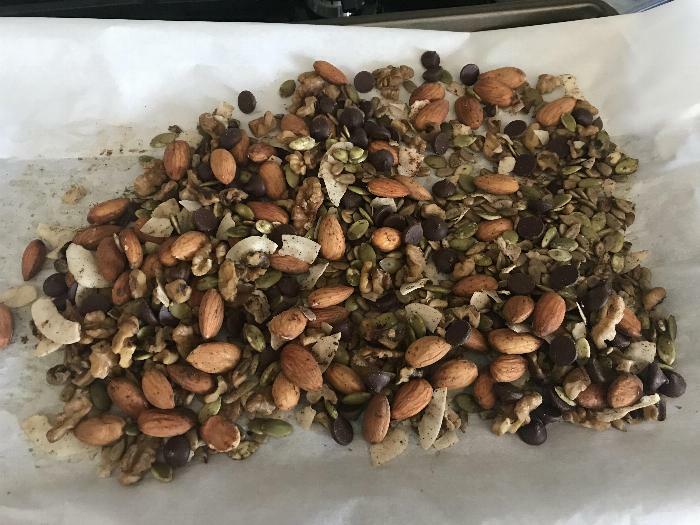 A homemade nut and seed mix with a hint of sweetness after adding cacao chips, vanilla, and cinnamon. A perfect high fat, protein snack. 2Preheat oven to 170 degrees Fahrenheit. If you have a "roast" or "dehydrate" setting on your oven you can use this as well. 3Line a large baking sheet parchment paper. 4Drain the water off the nuts and seeds. And put in a large bowl. 5Combine the soaked nuts and seeds, vanilla, and cinnamon until well mixed. 6Spread evenly over the baking sheet. 8Return the mix to a large bowl and add the coconut and cacao chips. I also made a batch with 100% cacao chips. Higher in fat and lower in sugar and carbs for those that don't mind the bitter chocolate.